.. So it begins! 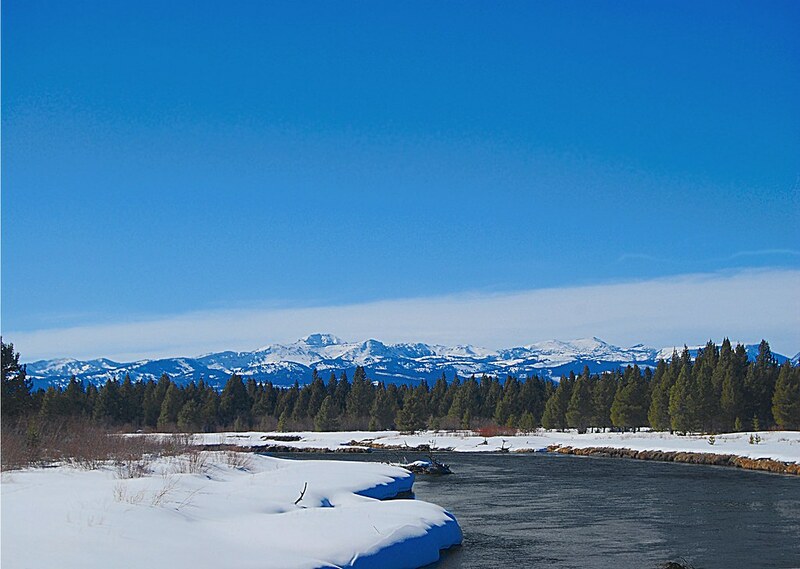 The West Yellowstone/Hebgen Lake Tournament, is a NAIFC qualifier. It is a three-day event - February 1st through 3rd, 2013. Two-thirds education and one-third competition with a maximum entry of 150 two-persons teams. This year the WY/Hebgen Lake Tournament will have an anticipated prize pool of at least $14,000.00 and could be as high as $21,000.00. Plus there are cash payouts from the Calcutta Saturday night. .. The town pubs have all gotten their teams preped and lubricated. One of the main features for the neighbors is the "BATTLE OF THE BARS." Prestige and quaffing rights will last until next year's tournament. .. Local merchants are sponsoring teams from the neighborhood. Please note: a local team beat all the national contenders in last year's tourney. It may happen again this year. Wives and girlfriends, husbands and boyfriends, lovers and companions, are all being scorned and neglected during the final days of prospecting and preparation for the big event. .. Scerecy is the big key. The neighbors borrow trucks so that they will not be recognized. They are wearing different clothing and hats that haven't been seen in decades. Some have shaved. Others have grown beards. Wigs and bandanas are used in the clandestine efforts to disguise who is fishing where. High-powered binoculars are essential equipment right now. .. On a less furtive note: It's a big event for the neighborhood kids. The KIDS ICE FISHING CAMP provides instruction and free fishing gear for all the kids that show up on Saturday. 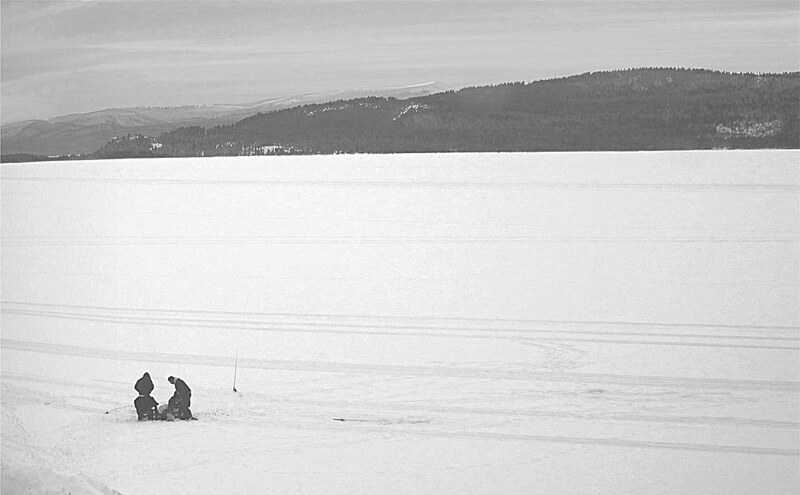 Ice Camp consists of in-class and on-ice fishing tutorials delivered by experienced, DNR certified NAIFC Pro-Staff instructors. In addition to demonstrations of the latest techniques and sponsor provided equipment, the curriculum promotes safety, conservation and environmental stewardship. Sponsors provide equipment and prizes for the activity, and kids who sign up and participate receive complimentary ice rods and tackle (HT Enterprises supplied over 1,100 “free” rods to kids last year). Although Ice Camp is geared toward kids, all family members are encouraged to attend regardless of age. Introduction to the newest technology coupled with professional guidance gives both the parent and child a memorable ice fishing experience. .. In the evening our village "KIDS 'N' SNOW" program includes 'smores 'n' more.' Ice Skating, Sledding on the sled hill, great music and gneral revelry. .. Should you be in the neighborhood stop in over the weekend; there's bound to be something that you will find interesting and enjoyable. >> February 2: Kids Ice camp at Kirkwood Resort & Marina Boathouse, 10:00 AM, all day fishing and prospecting and instructional seminars. KIDS 'N' SNOW weekend in the evening at the ice rink in town. >> February 2: Saturday Night Mandatory Rules Meeting. Registration for the Tournament runs from 4:30-6:45 pm at the Holiday Inn in West Yellowstone, where the Social Hour begins at 5:00 pm, including a complimentary dinner for all registered team members with cash bar. The Rules Meeting, which is mandatory for at least one member of each team, starts at 7 pm. At the Rules Meeting, the exact starting time for the contest the following morning will be announced. >> February 3: Morning, (starting time to be announced.) until 1:00 PM - THE TOURNAMENT! >> February 3: 2:00 PM, weigh in starts, at High Country Tavern & Grill. >> February 3: Evening, Revelry and Super Bowl Parties - all around the lake and in town. .. 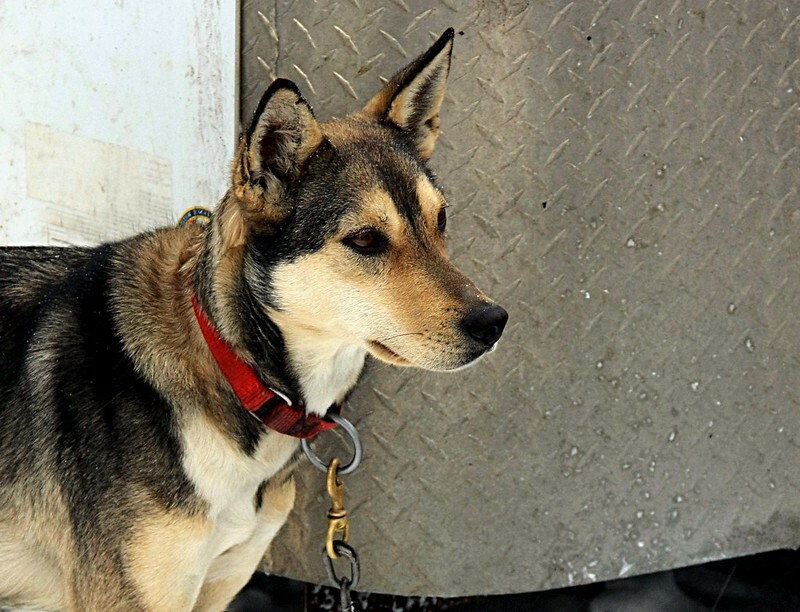 The top 21 sled dog teams in the world visited West Yellowstone over the weekend. .. 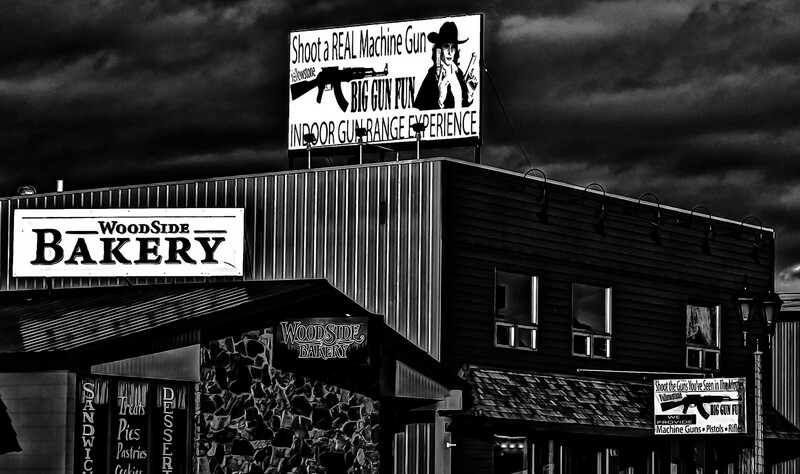 They were welcomed by the Chamber of Commerce and Wild West Pizzera, including a night of live music. .. The International Pedigree Stage Stop Race completed it's first cross-country stage yesterday. The race leader is world champion Buddy Streeper. .. West Yellowstone resident Charlotte Mooney finished the stage in eighth place with an average speed of 12.1 mph for the 56 mile stage that ended in Ashton, Idaho. .. Jenny Gregor from Bozeman finished in twentieth place with an average speed of 10.3 mph. .. A volunteer force of our neighbors took over the duties of staging the teams, weighing the required equipment to be carried, directing traffic, setting course markers, notifying teams of starting position, and general go-fer duties. 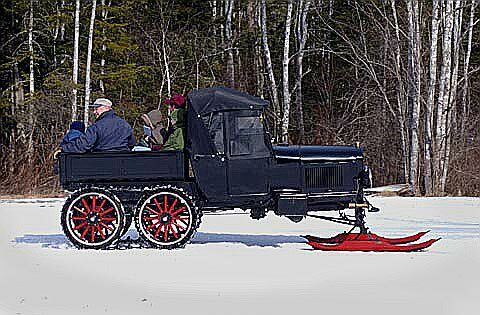 .. Fisher folks in the crowd of well wishers reveled in the fresh wet snow that lubricated the nicely groomed trail. 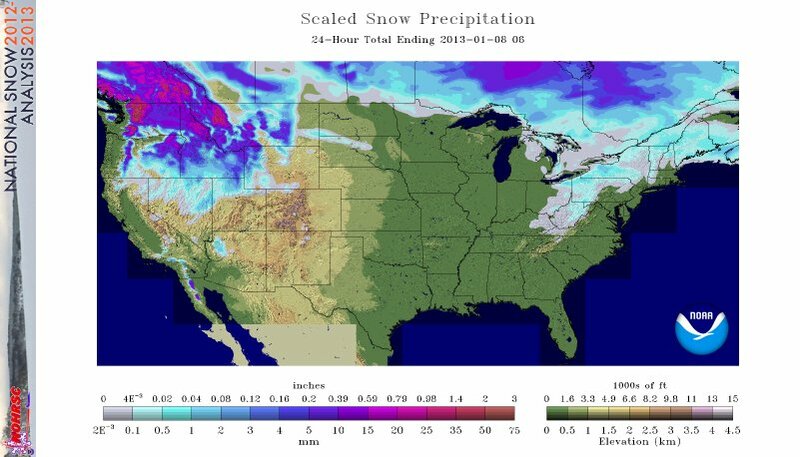 It is much needed for our snowpack and is a cause for some back-slapping and rib-digging hijinx. .. The start of the race, after the evening's festivities, went off smoothly and all teams finished the stage in good shape. .. This race is the largest stage race outside of Alaska, (over 350 miles.) Entries this year included teams from Sweden, Wyoming, Montana, Minnesota, Canada, Alaska, Oregon, and Michigan. .. The neighborhood kids had a grand time checking out the license plates on the team rigs. Seldom seen plates from Yellowknife, Northwest Territories, and Alaska were the subject of much posing and picture taking. .. The purse for the race is $170,000. Stage money includes over $800 for first place, over $700 for second, over $500 for third - - etc. .. 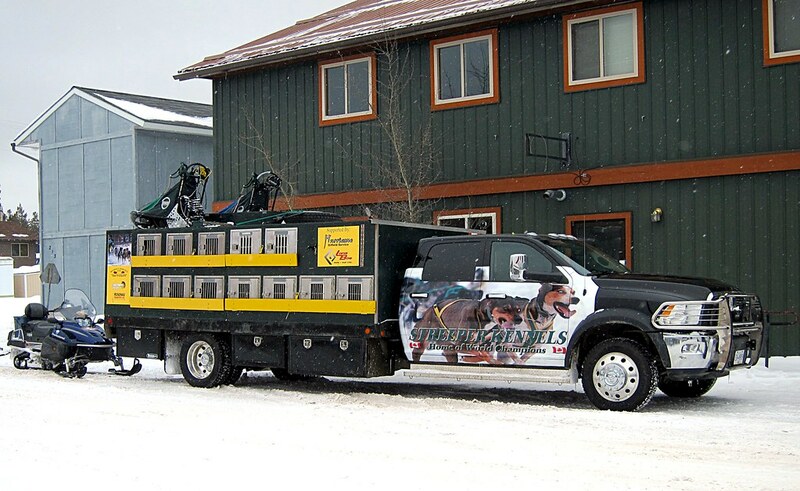 The major sponsor of the race is Pedigree Dog Food. The company also donates a year's supply of dog food to a local shelter at each stop along the race trail. We're looking forward to next year's event. 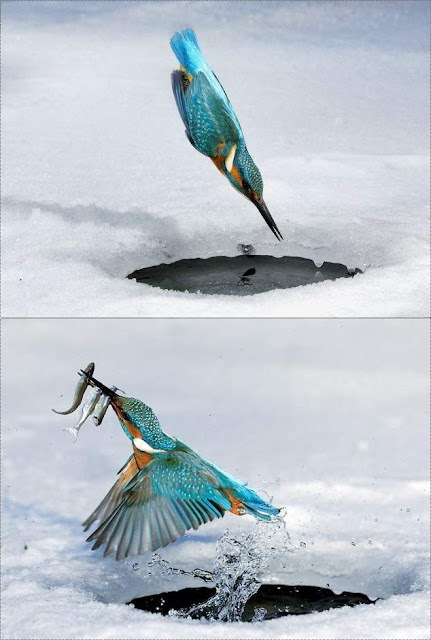 .. Now our attention is turned to the ice fishing tournement. Blue buns galore! .. Takes have been good. Fish have been large, giant, enormous, and too big to mention. Some have even been trout. .. On the other foot, conventional and unimaginative fishers, with nads of steel are still wading the frigid waters Between The Lakes. .. Catching has been better than good. Elbows are fewer than expected - there's even unused parking spaces on the highway. .. Standard offerings are working their wonders. Double nymph rigs, nymph and ugly rigs, gobs of worms, and the occasional dry dropper rigs are just plain unfailing in their success right now. .. Many of the non-establishment fly fishers in the neighborhood are foregoing the current catching frenzy for their volunteer work with the upcoming sled dog race this coming weekend. .. Establishment fishers aren't bothering. Establishment fishers are busy hanging out in warm feather merchant shops and talking about fishing - bless their hearts - must be cold out. WADE NOT - FREEZE NOT ! .. 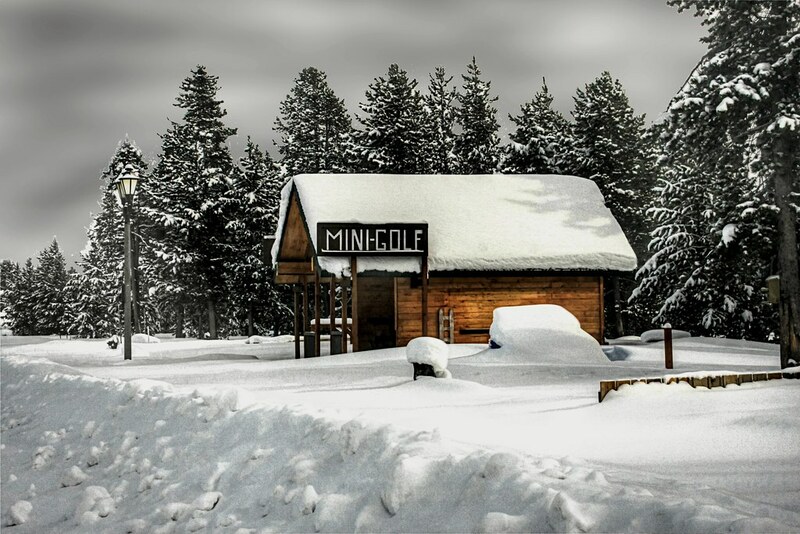 Many of the visitor-centered eateries in our village are closed in the winter. Probably a good thing. Most of the commercial food in town comes in on the same truck. .. Our locally owned and family run restaurants operate on a small margin. They need the neighborhood business, and will cook your burger to order. Local beef is featured. The patties are freshly made. Rare fare and delicious too. 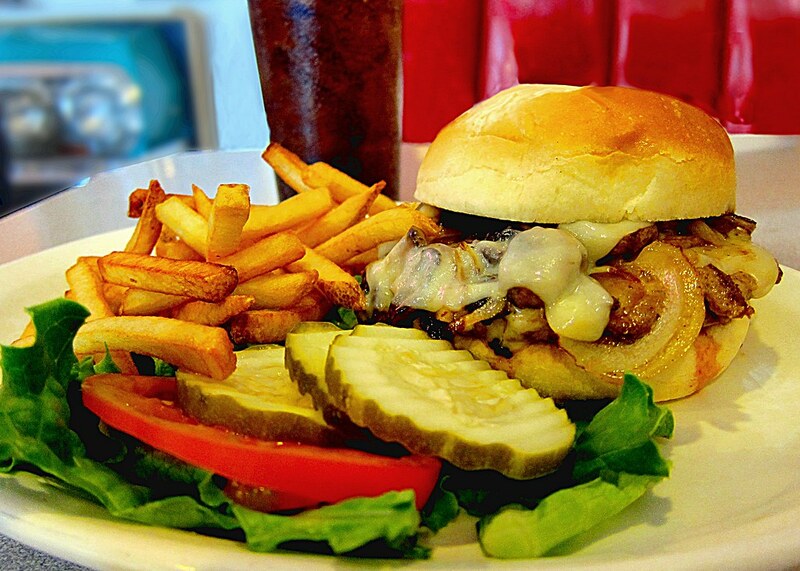 .. Should you find yourself up this way we suggest you avail yourself of the local hamburgers. how about this year ?? 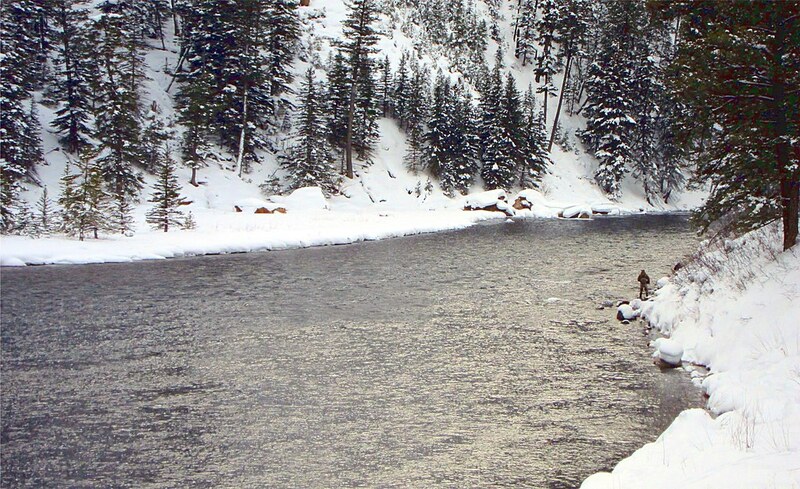 .. At 36 below zero it's hard to convince ourselves to get down to the river and molest some fish. So we join the neighbors in several deep-deep-cold activities. One of the most popular is watching the snow plows. .. The excitement is underwhelming. They come by in a whoosh. The fine powder billows up and settles along the edge of the road. Fantastic fun. We can do it for hours - mostly because our feet are frozen to the ground. Try it, you'll like it! .. Sunday morning dawned cold and clear after a night where the temperature sagged into record territory. None of the neighbors, (save one,) went fishing. He's probably still on Hebgen Lake with his drawers frozen to the ice. .. Most of the neighbors were in town and ready to observe, (or help with,) the West Yellowstone Fun Run. .. 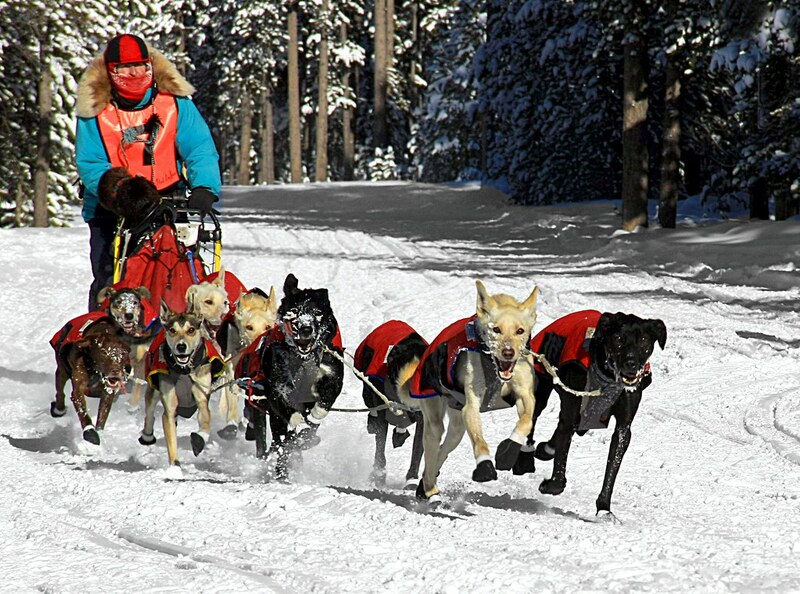 This is a 30 mile sprint for sled dogs and mushers. 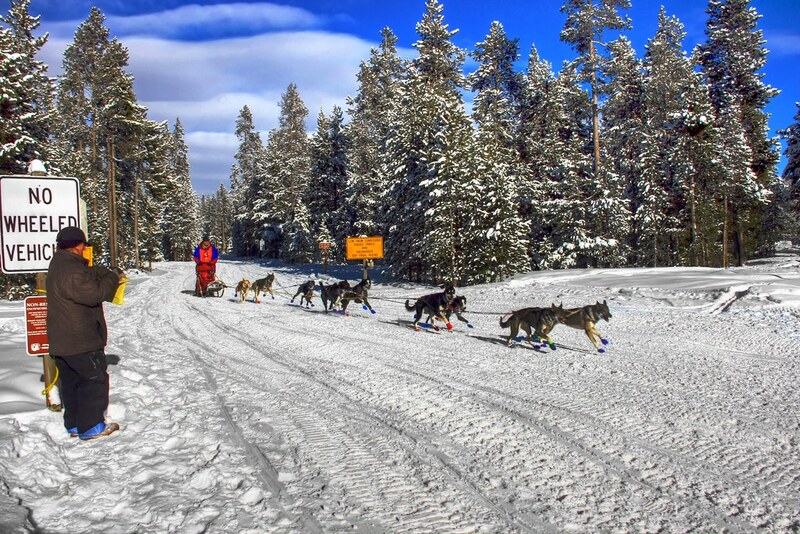 It's one of the last tune-up races in the training schedule for the International Pedigree Stage Stop Sled Dog Race, (IPSSSDR.) 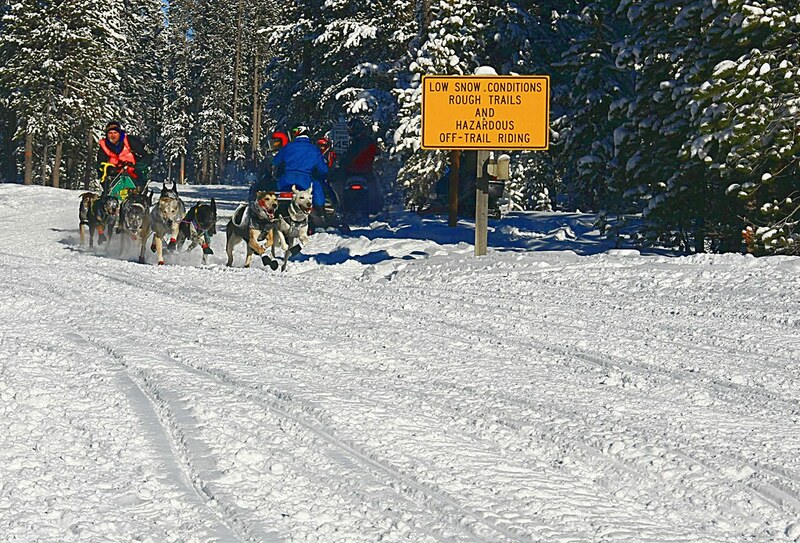 the largest sled dog race in the lower 48 states. .. The start of the race was posponed an hour until 11:00 AM so that it could begin at a balmy -6° F. It went off without a hitch, (oops,) and was completed in a couple of hours with all the teams doing better than a 13mph, average. .. 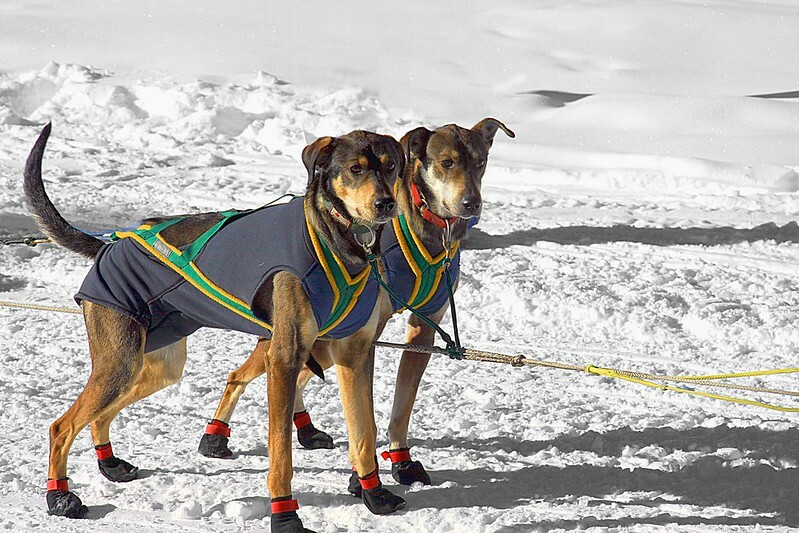 The sprint dogs are specialized athletes. They are not the distance dogs, (marathon or load carriers,) that are featured in movies and T.V. ads. They are toned to a rock hard muscle tone. They have deep chests. They seldom have long hair. They are gregarious, happy, vocal, playful, and eager to run. .. 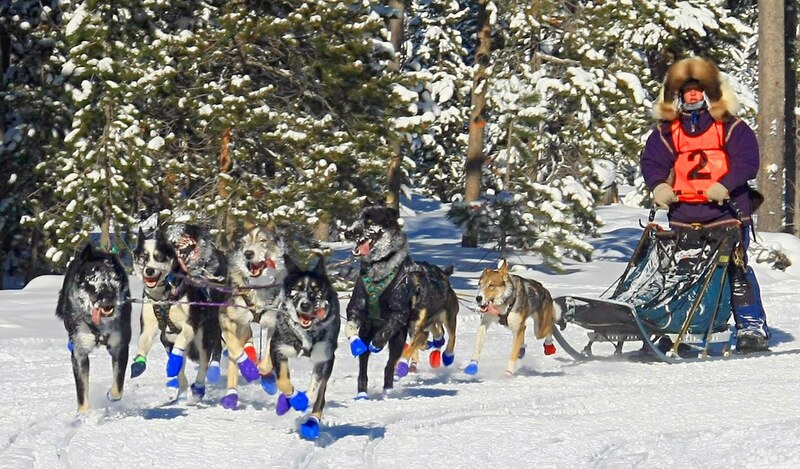 These dogs train year round. During the non-snow season the teams occasionally drag a 4-wheeler around the trails in the woods. 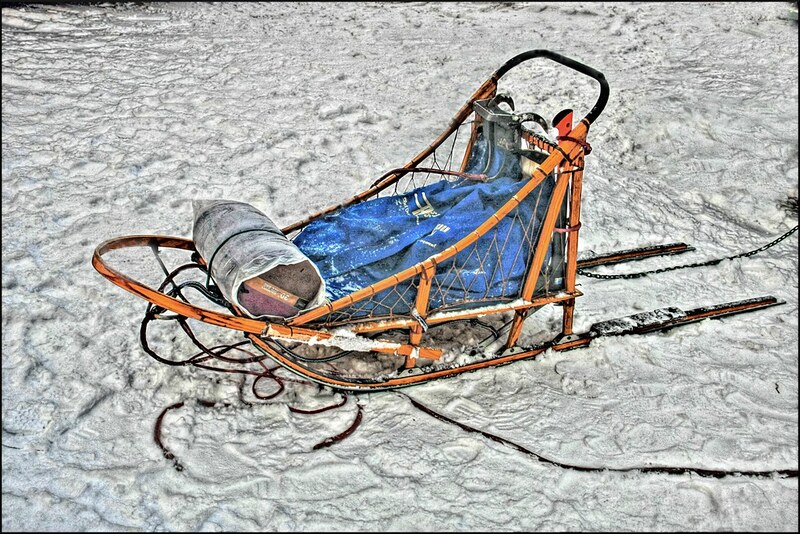 As soon as snow hits the ground, training with a sled, a musher, and some weight begins in all seriousness. .. It takes special people and special dogs to produce a top international race event. The West Yellowstone Fun Run is one of the events that qualify. .. The IPSSSDR is another premium event and will visit our village on January 27, 2013. The West Yellowstone segment of the IPSSSDR race covers 56 miiles and is the longest leg of the race. The total race length is over 350 miles. The purse for the race is slated to top $170,000.00. .. Should you be in the neighborhood drop in and take a break from ice in your guides. 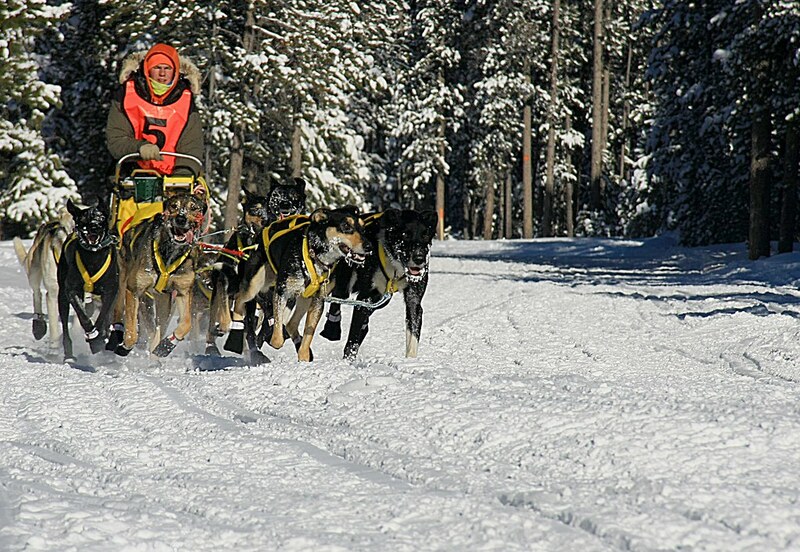 OR - stay a couple of days and visit with the racers or take a ride in a dog sled. .. It's been on the cool side of the thermometer since the storm left the neighborhood. We have run out of degrees every evening and some times end up owing 20 or 30 of them. 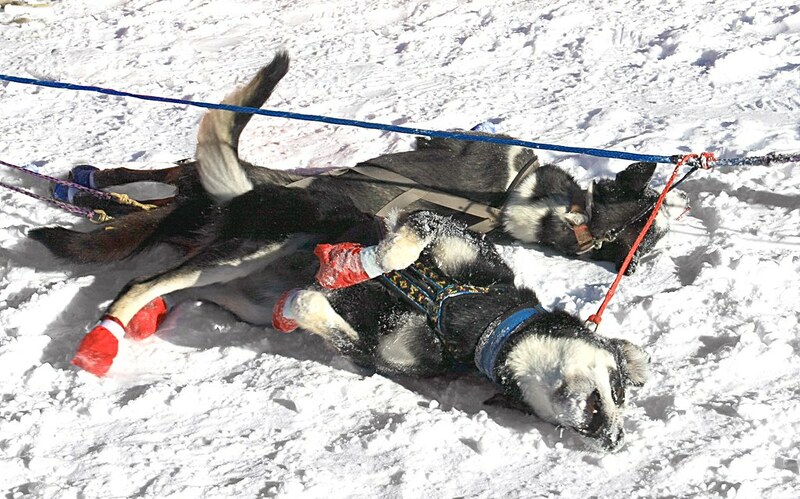 .. Tonight looks to be on the warm side of -20° F. That's good because the dogs are racing early tomorrow morning. The teams have been training for a week and have had a day or two for R&R. 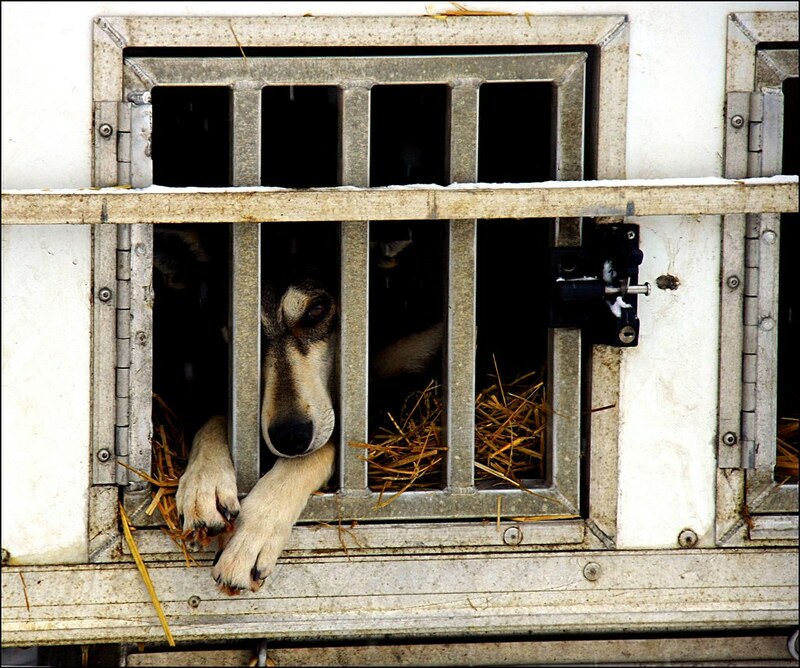 The race start at 10:00 AM: musher's meeting at 9:00 AM. READ ABOUT IT HERE. .. We're headed that way now. .. The NATIONAL WEATHER SERVICE is our freind. The warning is posted below. We're loving it. The fish will appreciate it. 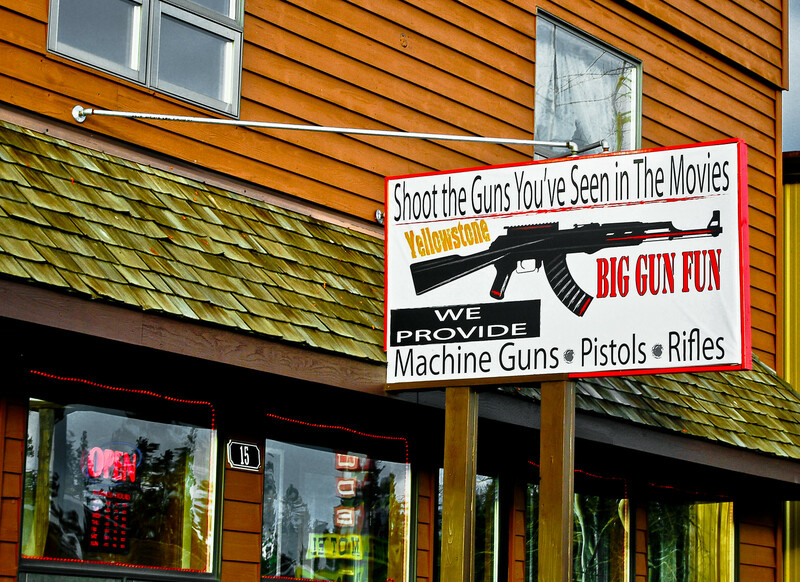 .. Just down the block is a nice indoor shooting range. We are going there - hopefully. 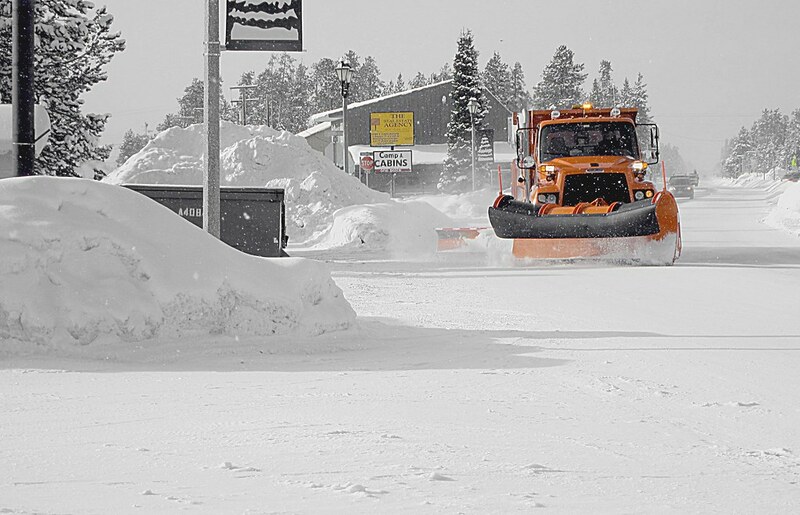 A WINTER STORM WARNING FOR HEAVY SNOW AND BLOWING SNOW REMAINS IN EFFECT UNTIL 11 PM MST FRIDAY. * TIMING AND MAIN IMPACT: SNOW...HEAVY AT TIMES...WILL DEVELOP OVER THE REGION THIS MORNING. ACCUMULATING SNOWFALL WILL CONTINUE THROUGH TONIGHT AND INTO FRIDAY. AREAS OF BLOWING SNOW...ESPECIALLY ON FRIDAY...WILL ALSO REDUCE VISIBILITIES. EXPECT ROADWAYS TO GRADUALLY BECOME SNOW AND ICE COVERED TODAY. * SNOW ACCUMULATIONS: AT LOWER ELEVATIONS...EXPECT TOTAL SNOW ACCUMULATIONS OF 7 TO 12 INCHES...WITH ISOLATED AMOUNTS UP TO 15 INCHES. IN THE MOUNTAINS...EXPECT TOTAL SNOW ACCUMULATIONS OF 1 TO 2 FEET...WITH ISOLATED AMOUNTS UP TO 3 FEET. * WINDS AND VISIBILITY: NORTH WINDS GUSTING BETWEEN 20 AND 30 MPH AT TIMES WILL PRODUCE AREAS OF BLOWING SNOW. VISIBILITIES WILL BE REDUCED TO LESS THAN ONE HALF MILE TIMES IN PERIODS OF HEAVIER SNOW. * OTHER IMPACTS: ROADWAYS WILL INITIALLY BECOME ICY BY LATE THIS MORNING...AS COLDER AIR MOVES INTO THE REGION FREEZING WET PAVEMENT SURFACES...THEN SNOW WILL BEGIN TO COVER THE ROADWAYS. ADDITIONALLY...WIND CHILL VALUES WILL FALL WELL BELOW ZERO BY FRIDAY MORNING. * LOCATIONS AFFECTED INCLUDE: ALL OF NORTH CENTRAL AND SOUTHWEST MONTANA. A WINTER STORM WARNING FOR HEAVY SNOW MEANS SEVERE WINTER WEATHER CONDITIONS ARE EXPECTED OR OCCURRING. SIGNIFICANT AMOUNTS OF SNOW ARE FORECAST THAT WILL MAKE TRAVEL HAZARDOUS. IF YOU MUST TRAVEL...KEEP AN EXTRA FLASHLIGHT...FOOD...AND WATER IN YOUR VEHICLE IN CASE OF AN EMERGENCY. .. It's a bit brisk outside right now, (-19 F.) Keeps the Hoi Polloi down. Some of the neighbors too! .. On the other hand, the young lions of the neighborhood are making hay while the temps are low. .. There's a certain bit of stuff in the fiber of 5 or 6 of our younger neighbors that demands that they fish, weather be damned! 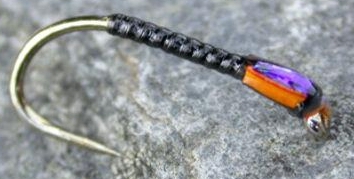 They are courageous, immune to the cold, and very facile in the art of tying "fun flies." .. 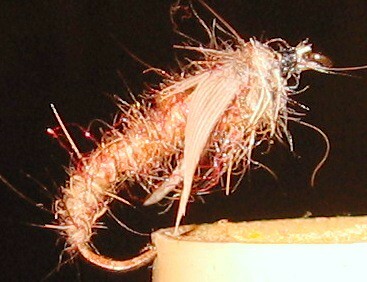 The KILLER MIDGE is one of the current favorites of these folks. It's a size 22, (or 24, or 26 - yikes,) standard, blue-black midge pattern with a couple of simple, (they tell us,) modifications. The upright fan wings made from very small chicken feathers are the most noticable modification. 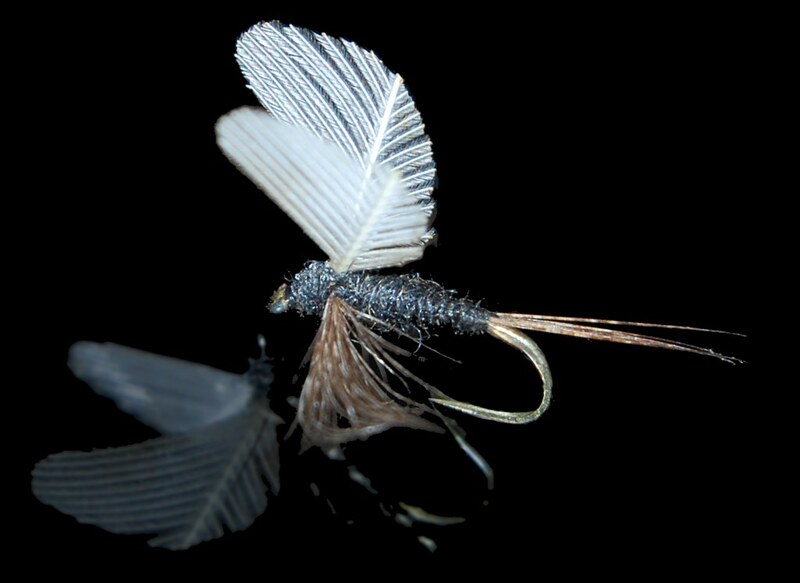 Outriggers made of fibers from chuckar partridge rump feathers is another added accoutrement. .. The body is made of black Antron. The tail is pheasant fibers. Everything is way too small to see if you're of the mature variety of fisher. 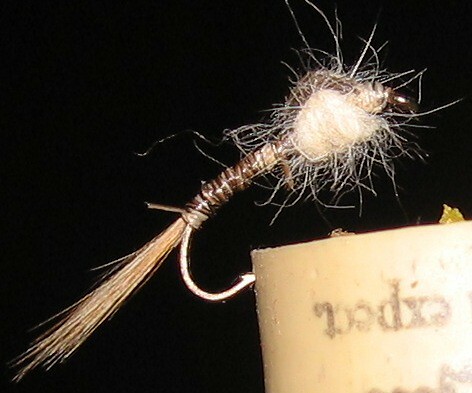 .. Well greased, (or the contemporary equivalent,) these little dumplings float high, are easy to see, (relatively,) and are irresistable to the trout on the Madison River between the lakes in the Hebgan Tailwater. .. 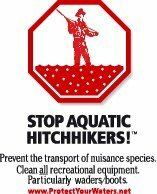 The neighborhood jargon refers to midges that hatch on the sunny days during the winter as 'snow flies.' Bright sun brings them out in the late morning or early afternoon. Catching is best on still days - of course. It's been perfect for about a week now. .. Two nights ago it was -26 F, last night it was -22F. The cold air bothers neither the fish nor the flies, nor the kids. We watch. At -20 F particulates leave the air, the clouds thin out and the sky gets real big.